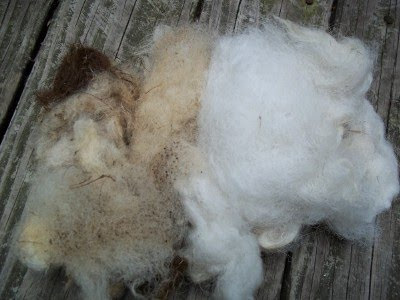 One last photo of the Cormo fleece before I throw it in the suds. I just can't get enough of this stuff. I have no idea why dirty sheep fleece makes me so happy, but it does. It really does. 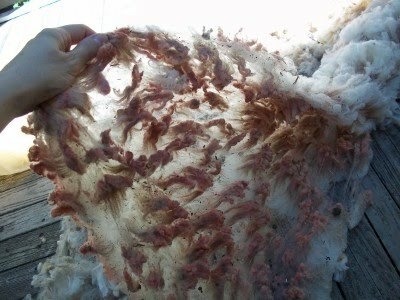 Here is another photo of the giant fleece I really need to wash before the weather turns too cold. I am NO expert on wool washing but through trial and error I have discovered some tricks that work for me. 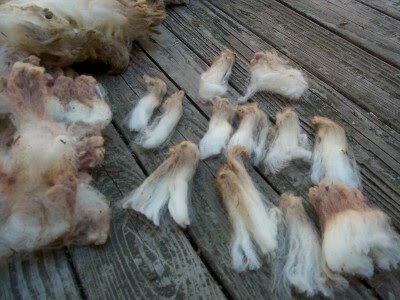 I learned that if you tug on the dirty tufts you can pull out the locks without disturbing the formation. 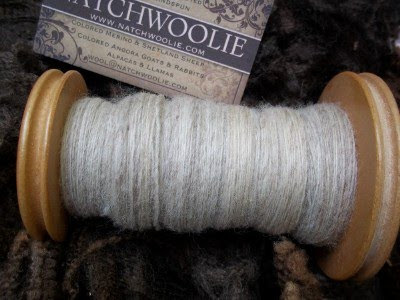 Cormo is an extremely fine wool and if you disturb the lock in any way you get a wad that is impossible to spin. It reminded me of picking crabs for crab cakes. It took me all afternoon to work my way through this thing. I ended up with 7 grocery bags stuffed with locks all ready to be washed. I don't know the head from the tail of the thing but I tried to put the locks that came from the same area together. I am not sure why but if it turns out to be important, I've got it covered. I spent the entire day with a big bag of stuff that used to look like this little guy. That's a baby Cormo. I want one. 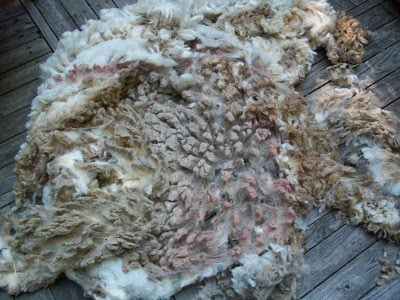 Spread out over my deck, my precious fleece now looks like a 80's shag rug that saw too many parties. I have to admit that it weirded me out just a bit to see it all attached to itself in its former sheepy shape. 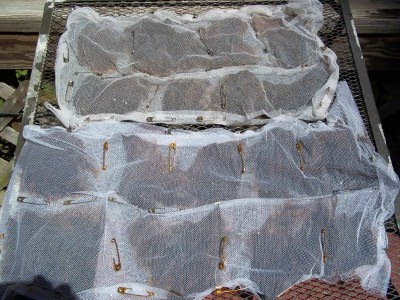 This is the first time I have pulled my entire 9 pounds of Cormo out of its bag to sort it. It's going to be quite a job. 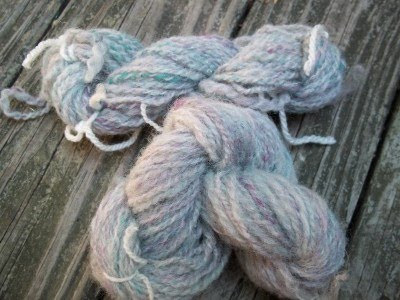 Last summer, I bought 4 ounces of Merino from a little sheep called Oreo and spun it on my Ashford Traveler. It was lovely, but not enough to do much with. 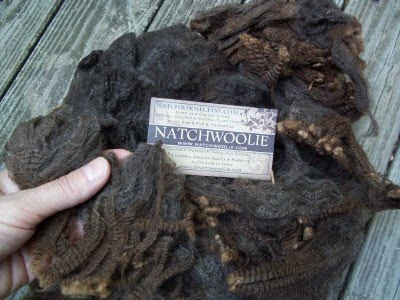 Meet Rodeo, another 4 ounce Merino sample from Natchwoolie. 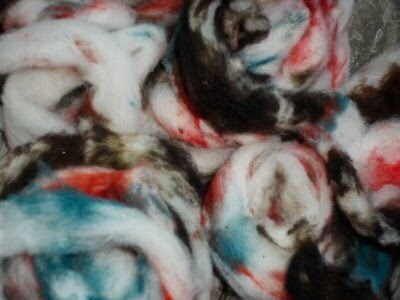 I am hoping that Oreo and Rodeo will ply together and give me enough yarn for a smallish something or other. Even though it was ridiculously clean, Rodeo got a bubble bath. Then he dried in the cool Autumn sun. 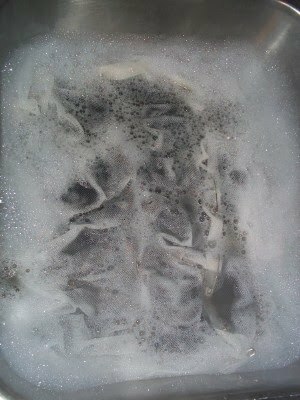 I am afraid my best washing days are behind me. The sun is only shining on the deck for about 2 hours now. 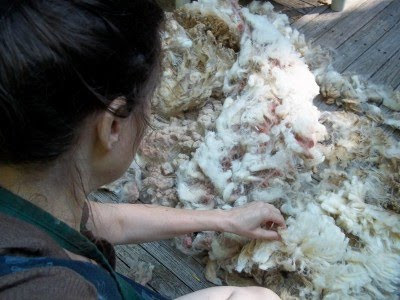 I better get moving on all the wool left to clean before winter. I made a slipper that looks like the classic Phentex version on the outside but the inside is a holy mess. I tried to knit it in the round and steek it. 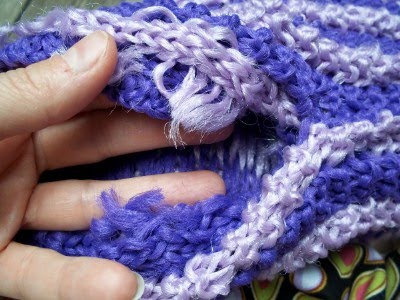 Steeking is separating a seam in knitted material by cutting it. I cut out the area where the foot slides in. 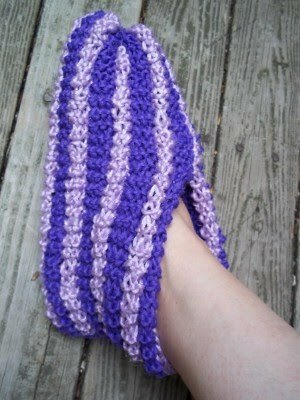 Even though I gave it a trial run, it was not doable in the actual slipper because the slippery stuff defied staying where I wanted it to stay. 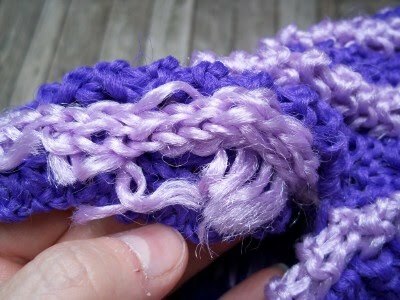 After crocheting the edging, the seams were so bulky they would not fold over and stay stitched down. Needless to say this thing is not getting a mate. I'm not even going to say that this was a waste of good yarn because the new Phentex slipper yarn is horrible-nothing at all like the lovely vintage stuff. In Ravelry speak: It's an Ugh. Thanks to The Mister having double hernia surgery this past week, I have been knocking out the projects right and left. In spite of it all, my coffee table still looks like this. Even being retired, there is just not enough hours in the day. Today is my little sister's birthday. 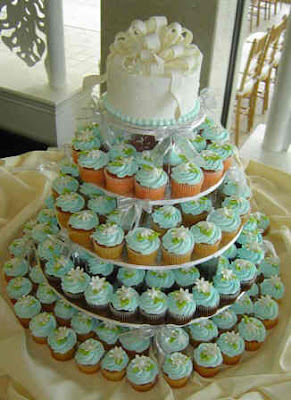 Next year we will both be a Mother of the Something (her son, my daughter) and this birthday wish is actually a gentle reminder that she offered to help me figure out how to make a cupcake tree for Daughter's engagement party in November. I am going to need about 100 cupcakes and I have NO talent for such things. 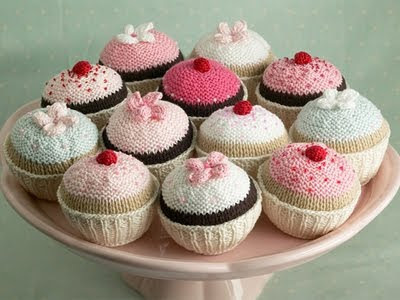 I could knit up a few but I doubt that would go over well with Bride to Be and her guests. These adorable things are the work of Little Cotton Rabbit whose blog is here. Her pattern can be found over on Etsy. Yum! And... if you haven't already checked out my Mother of the Bride Blog, you can find it here. I never got the knack of taking pictures of myself. Daughter makes it look so easy over on her blog. 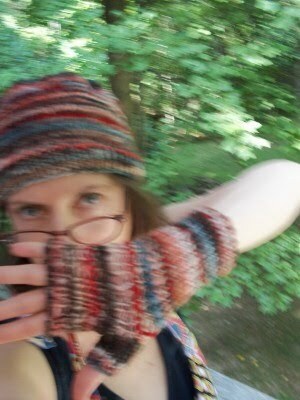 What I was trying to capture was the Crazy Cormo Hat and Mitt set that is the first project I have finished from the giant 9 pound bag of raw fleece that I bought from the MD Sheep and Wool Fest this year. 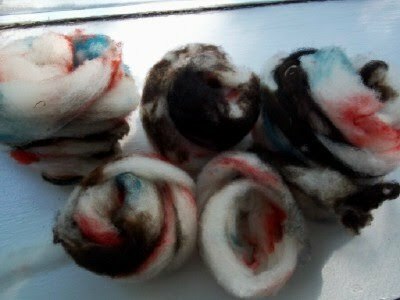 This is the first washing that I ruined and turned into some wonky batts and then spun willy-nilly, just for fun. I wanted to show myself wearing it, on an 80 degree day, because this stuff is so soft and wonderful I did not want to take it off. 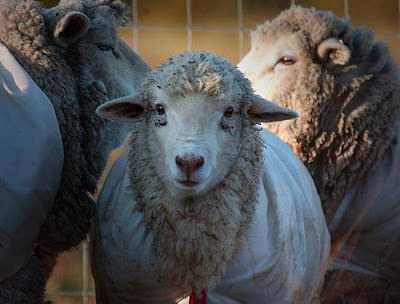 I love wool but NOT next to my skin and NEVER on a hot day. 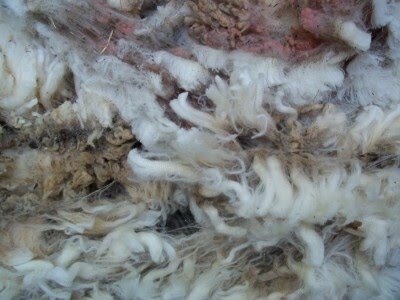 Cormo is not like any wool I have ever felt. I could knit underwear out of it. And wear it. 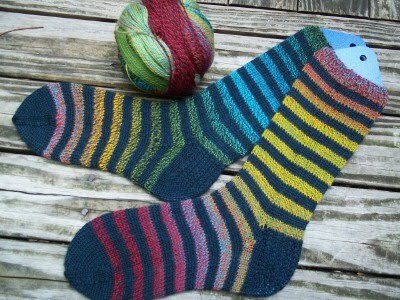 The Crazy Zauberball Socks are done and I LOVE them. You can't get more fun than this. I plan to wear them to the hospital on the day of my surgery, whenever that may be. The jogs are not so terrible, but with the remainder of the ball, I am going to try another technique to avoid that pesky color join. Thank you kind commenter, Elizabeth, who told me where to go look for a better technique. 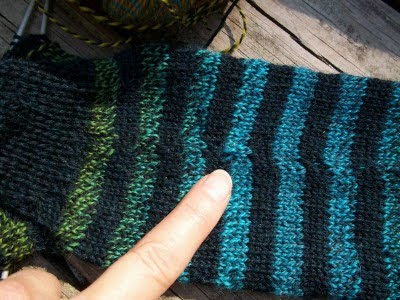 I am also going to go sew up that tiny hole on the heel right below the yellow stripe on sock number one. Right Now. That kind of thing drives me crazy and I never notice problems like that until I have taken the official mug shot and put all the stuff away. Jeesh. 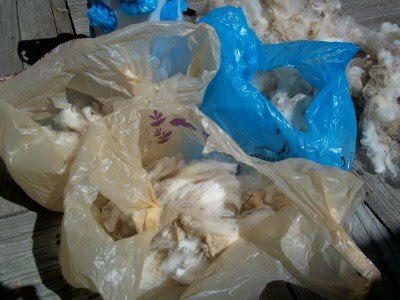 This is why I buy bags of stinky wool and wash it. 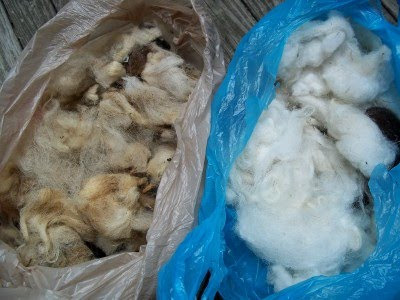 This is all the same Jacob fleece from that sorry pound I bought from someone I am happy to forget on ebay. The dirty bag has more in it than the clean bag and it is headed straight for the garbage. I love Jacob but this stuff was a real mess. 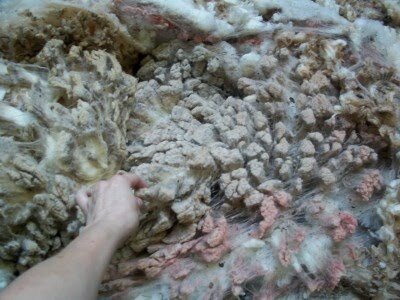 I can't even identify some of the things embedded in this wool. It's kind of scary. 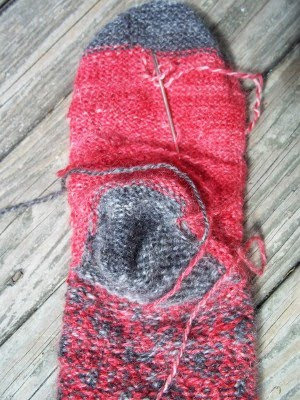 This photo of my inside out sock looks exactly like I feel right now. There has been too much drama around here lately. Too many decisions. Too many choices. I am a rut person. I want to fall into a rut and stay there for a long while. 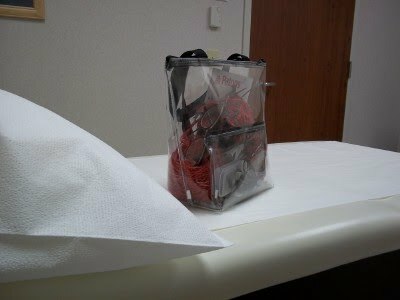 This was my carry around project for the past few months and they got a lot of mileage put on them in hospitals and doctor's offices. They are a bit baggy but then again so am I so I won't be complaining about that. I am glad they are done. I just wish my doctor days were behind me too. Now I am going to have to go find something else to carry along. Spinning in Public Day 2010 found me at a Bridal Expo in Virginia. Newly engaged Daughter and I can't get enough of everything wedding so it seemed like a good idea to head out to the Hilton for their Fall show. 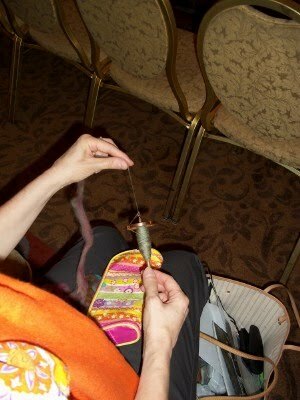 The whole thing was a waste of time but I did pull out the carry along spindle for a brief few seconds while we made up our minds whether to brave the two hour wait for the bridal fashion show. We didn't. We had a lot more fun later that afternoon trying on extravagant gowns and ridiculous shoes at a nearby outlet mall. 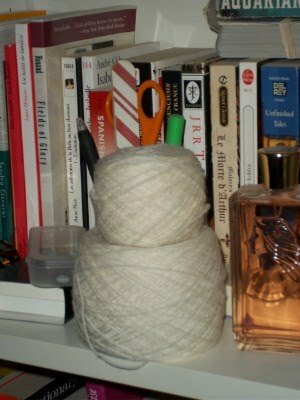 I was spinning along happily on the second bobbin of my Peruvian wool, when I noticed that the first bobbin that I had put on the top post of the built in lazy kate was spinning. That's not good. 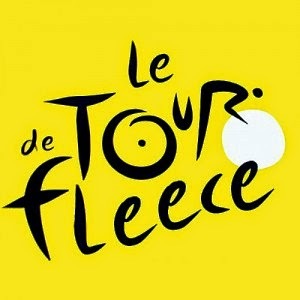 When I looked to find out where all the spin was coming from I noticed that the leader had attached itself to my wheel post and was neatly wrapping itself into a giant spool of now useless singles that had to be cut free. It seems that storing your full bobbins on the Ladybug's lazy kate is a bad idea. Very bad. 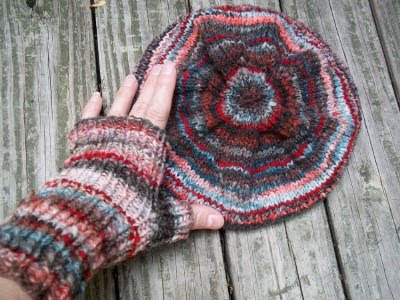 About a quarter into the mitts that match my Cormo hat, I realized I was going to run out of yarn. I had to crank out a quick batt and then try to dye it to match. I think I have too much white in this batch. And don't ask me how-but the green that I thought I had put on too heavily all but disappeared. The one thing I have not been able to do with Mr. Nasty Gallbladder on board was to bend forward without pain. Terrible pain. 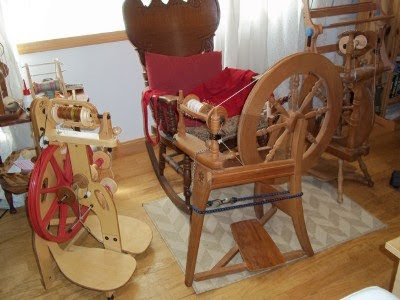 The wheels have been out of the question and so is the loom and the drum carder. All my favorite toys have been sitting idly by waiting for this giant ache under my ribs to go away. My last visit to the ER resulted in my being given some mild pain meds so I have managed to sit a few minutes at a time to spin on a project or two. 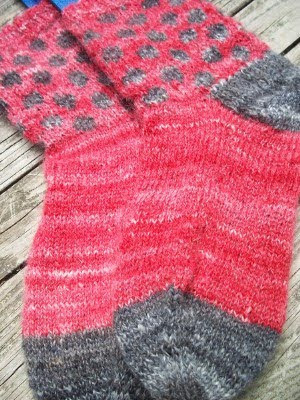 This is the new Ladybug with the 100% Peruvian wool from Knit Picks that I dyed in figgy colors a few weeks ago. As advertised, it is very easy to spin. It is so reasonably priced, beginners could buy a ton of it to experiment with and not feel too bad about their first wonky bits. You get 100 grams which is a lot of wool for only $2.89. 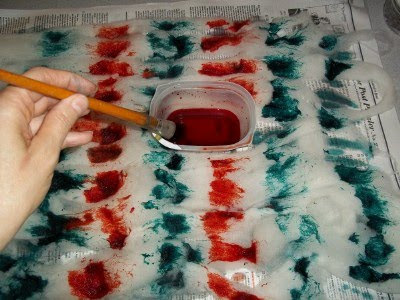 You would pay $15-$20 for this same stuff that someone has already dyed for you on Etsy. I will easily be able to get a pair of socks or mittens out of it with leftovers. What a deal. I have been through hell and back with this gall bladder surgery thing that has kept me pretty much in hysterics for a month now. First it was on, then it was off and then it was on again and now off. I am not even counting the Sunday morning in the ER, the 4 times I had to give blood the 3 scans or the 2 sonograms. It was not fun. Not at all. 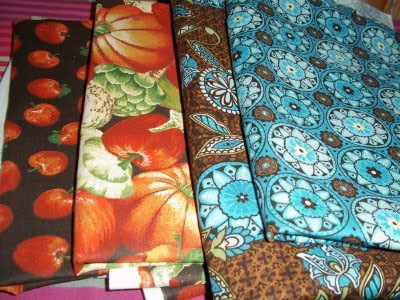 The week before the first surgery was scheduled, I took myself to the local Walmart, the one around here that still sells fabric, and bought myself enough material for 2 more aprons. I was determined to put all this behind me and concentrate on my future with food. Living on instant potatoes and jello for almost a month has left me very hungry and I intend to make up for it in the kitchen-someday. After correcting the arm wobble with masking tape, I am ready to go on project number two. 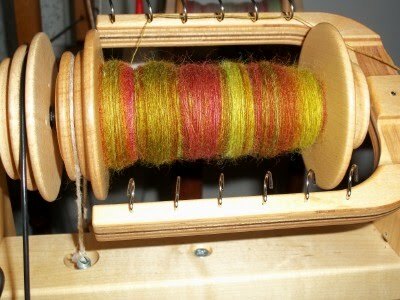 This time instead of a wonky batt, I am spinning some commercial Corriedale top from the stash. I still have to add a lot of extra spin to keep the single from breaking. 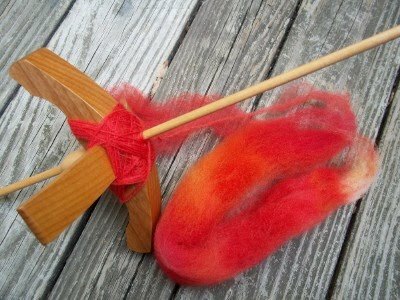 I suspect I am trying to spin too thin for this weight of spindle but it's my default now and I can't seem to break the habit. Anything thicker than this just doesn't look right to me. The good thing about the underspin I get with this thing is that the singles puff back up nicely to make a thicker, fluffier two ply in spite of what my fingers will allow. 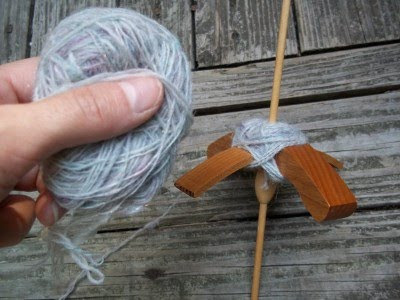 I guess what I am trying to say here is that the spindle has more sense than I do. I'll never complain about projects that take a long time again. 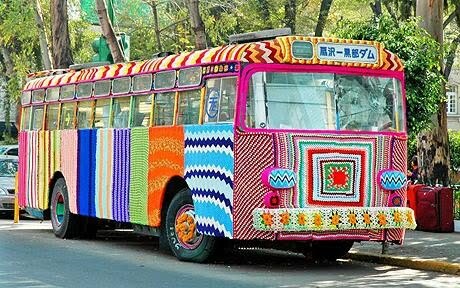 I love the Granny Square bumpers. Too bad Mini's don't have real bumpers or I just might be tempted. I wasn't sure what to make of the Crazy Zauberball that Daughter had gifted me. 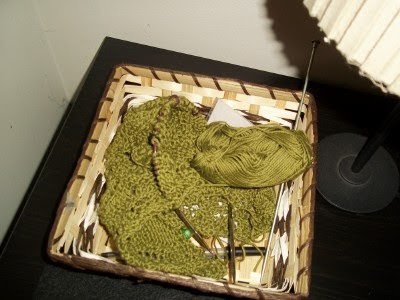 A Ravelry search turned up a zillion different uses for this yarn-most of which were NOT socks. 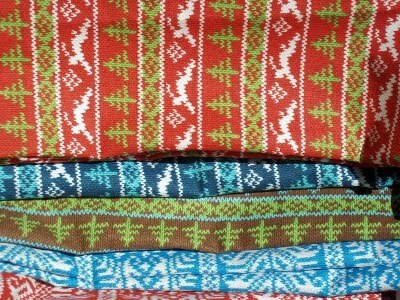 The most popular use was with shawls as the color changes are long and not repetitive. If you are into matching socks this stuff is NOT for you. I was tempted to start a Revontuli but thought better of it. 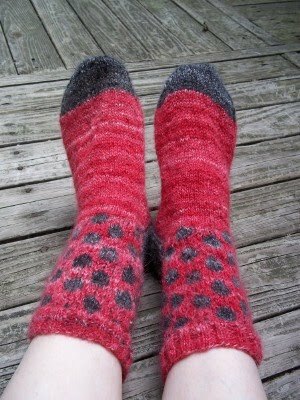 I now have 16 WIPs on Ravelry. For shame. 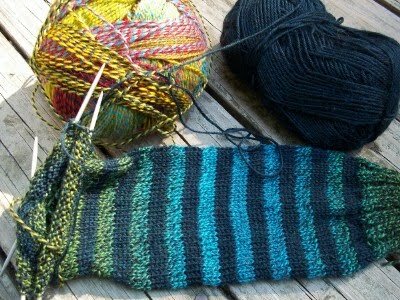 I really wanted socks, nice simple socks, but to add some element of continuity, I decided to stripe it with some Midnight Heather Stroll that I already had in my stash. Stripes come with unwelcome color jogs so I did some research on how to avoid them. I tried the "slip the first stitch" trick but it sure looks like I still have jogs. I am going have to keep looking for a better technique. I hate jogs. 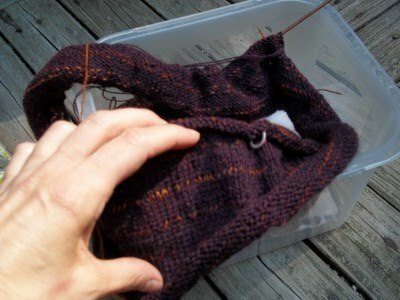 This is the THIRD TIME I have had to restart the body for my Classic Lines Cardigan. It's a very good thing that I finished the sleeves first or I might have just given up. I still have a long way to go but at least I think it's going to all work out this time. Maybe. By now I should have had my gallbladder out. Twice. My surgery has been canceled for some minor complications due to sketchy blood work-two times now. It's like the governor calling in a reprieve at the last possible moment-almost-because I know that sucker's gotta come out sooner or later. 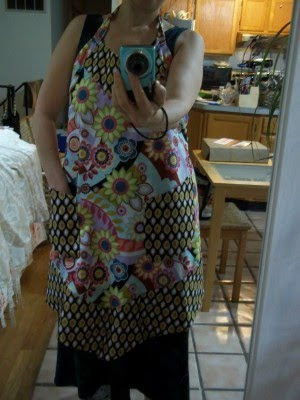 I shamed myself into getting my apron finished last night. I love it but it certainly is nothing to brag about. My sewing skills are PITIFUL. If I had made it in Home Ec I would expect a C. Maybe even a C-. 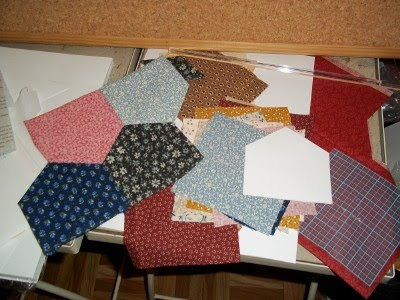 I had a terrible time following the directions on this "easy" pattern but I intend to give it another try as soon as I can budget out a few bucks for more material. 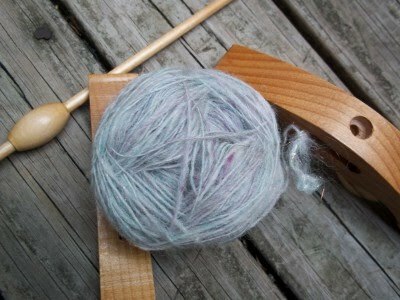 I finally finished up all the singles with my new Turkish Spindle and am ready to ply. It was nice to have the ball all ready to go. 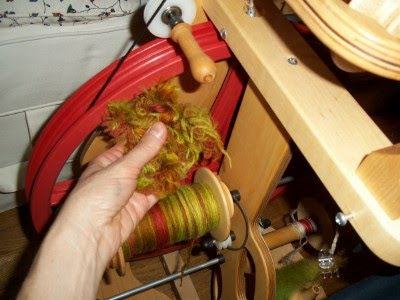 I did have some technical difficulties as my spindle arms would not stay tightly enough on the shaft to get a good spin this time around. It was very annoying. I had to use a masking tape wrap to hold things together. In the beginning, I had divided this project in two and spun half on a regular drop spindle and half on the Turkish just to see the difference. 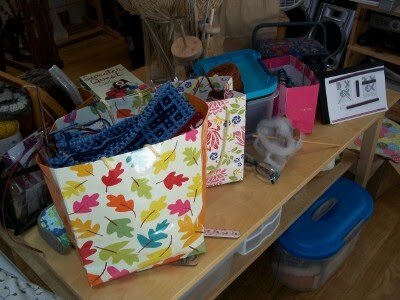 The left side is the Turkish spun yarn. It is lighter and looser. It has a more halo. 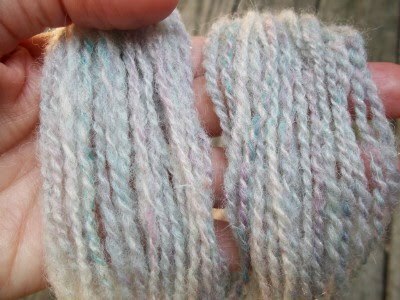 You can see the difference better in skeins. The bottom one is the Turkish two ply. It's not bad-just different. Now to swatch them. 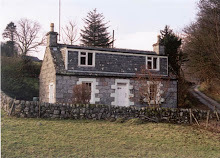 I managed to get through August on my first pension check without any financial catastrophes. 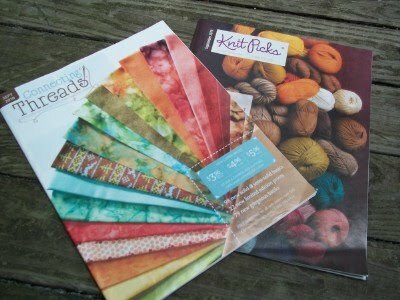 On August 31st I received check number 2 and these 2 catalogs in the mail. 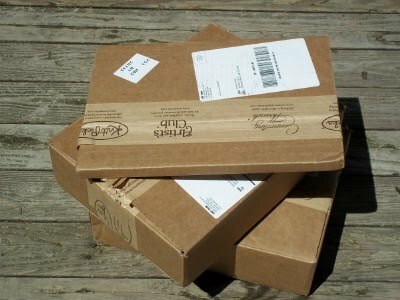 Soon after some boxes arrived. New cables. I can never have enough. 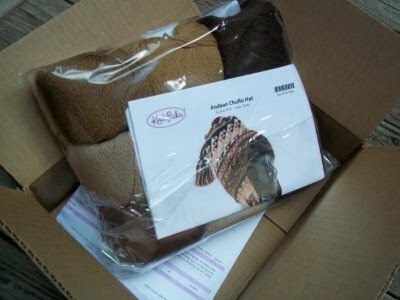 Another chullo, this time in browns. Note: I DO realize I have yet to knit the first kit I bought 2 years ago. I will get around to them someday. I will. Connecting Threads had this knit inspired fabric. I had to have a half a yard each of it. Had to. No plans for it. I just wanted it. My $50 monthly yarn budget is already gone and it is only the first week of the month. I need to stop spending and start making stuff. I am not getting much done these days. 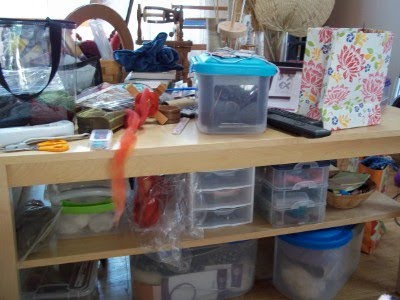 That which used to be my coffee table is filled with unfinished business. There are three levels to this table. All full. As are the wheels. The loom is mercifully empty. 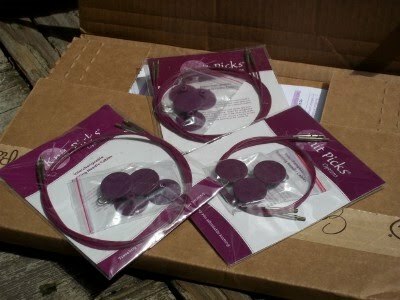 I wound these in anticipation of a lace project that I have yet to start. I did print out the pattern today. My lace tank top needs dusting. 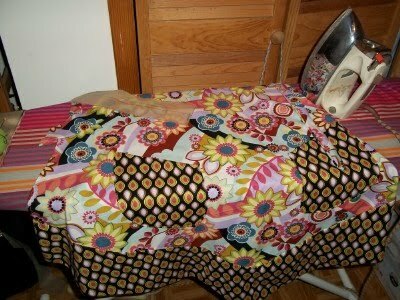 Ditto for my apron, along with my new sewing machine and ironing board. This is one of three quilts I am working on at the same time. I need some motivation to get some of this stuff done. I have fall projects that are waiting.